Yesterday at church I had the opportunity to perform a flute solo, which I always enjoy. On the way home from church, my daughter said, "You did great, Mom! You didn't mess up at all!" "Actually I did," I said. "I had a little flurble there in the middle where I didn't quite hit the notes right. But I'm glad I did." "What?" She asked, frowning in my rearview mirror. "What do you mean you're glad you messed up?" "Well, what if I never messed up? What if every time I played I did perfectly and didn't miss a note? People would think I was perfect at music. And if they thought that, then how would someone else feel when it was their turn to perform at church, like you're friend a few weeks ago? She might think, 'Oh man, Sister Tross always plays so perfectly. I can't ever be like her. What if I mess up?' And then she'd stress herself out and worry about measuring up to my perfection. I'd much rather that she- and everybody else- know that we're all just human and we can mess up and it's not a big deal and nobody's perfect." "But what if you don't mess up? Are you mad?" she asked. I laughed. "No, I'm not mad. I pray before every performance and I ask God to allow me to have the performance He wants me to have, whether it's perfect or full of mistakes. That way, I know that no matter what happens, as long as I pray and trust in Him, I'll know it was the performance I needed to have." My daughter still seemed a bit confused by this, but I'm hopeful that she'll understand this sooner rather than later. I think this concept is so important for us to remember in so many aspects of our lives. While it's wonderful to constantly strive for perfection (at least for things that matter, and to do so in a healthy way), I think it's even more important to recognize the value in imperfection. When we fall short- when we miss a note, when our published novel still has six typos, or when we have piles of laundry covering our couch when a friend stops by to visit- we actually give a gift to the world. We tell our audience, our reader, or our friend that we are not perfect, and we give them permission to not be perfect too. In this world where everything on our glowing screens is airbrushed, quoted, and highlight-reeled, it can be difficult at times to remember what being human and real actually means. It means screaming kids in the grocery store, finding stains on your shirt under the bright fluorescent lights after you've already gotten to church, sending an e-mail but forgetting the attachment, and writing "your" when you should have written "you're" in a Facebook post. We mess up. We're human. It's what we do. And it's time to stop pretending otherwise. 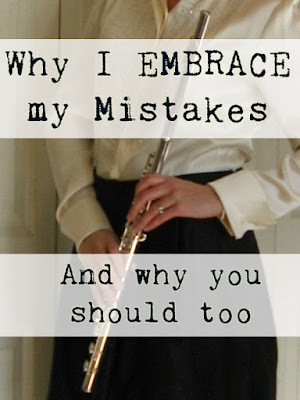 I'm here to tell you to EMBRACE the MISTAKES! Leave the house a little messy for a guest, sing off-key, laugh when you trip over your own feet, and then thank God for letting your life be a lovely, messy example of what it means to be real, to be human, and to be happy about it anyway. Go ahead, miss a note. It'll just make the world love you more. I like this. I accept that my house is always a little messy when it's just my family, but leaving the house a little messy for guests? That hit me where it hurts. However, with a new baby and guests coming in rapid succession of each other, it makes me feel a little better to think that the imperfection of my house is just part of being human. I found the mistake - "you're friend a few weeks ago?" Should be "your," but you knew that. And to be fair, I didn't notice at first glance. Thanks Katie! Is that really the only mistake I made? Wow, go figure! sweet, endearing post. it's true that we are too hard on ourselves. Where did we ever get the idea we can't make mistakes? it's unrealistic pressure!!! I tried to flute and it's HARD! How lovely that you play!